Launched in 2013, GIG-IT was a Facebook game that was aiming to be the first social game through which users could purchase real music tracks to download. 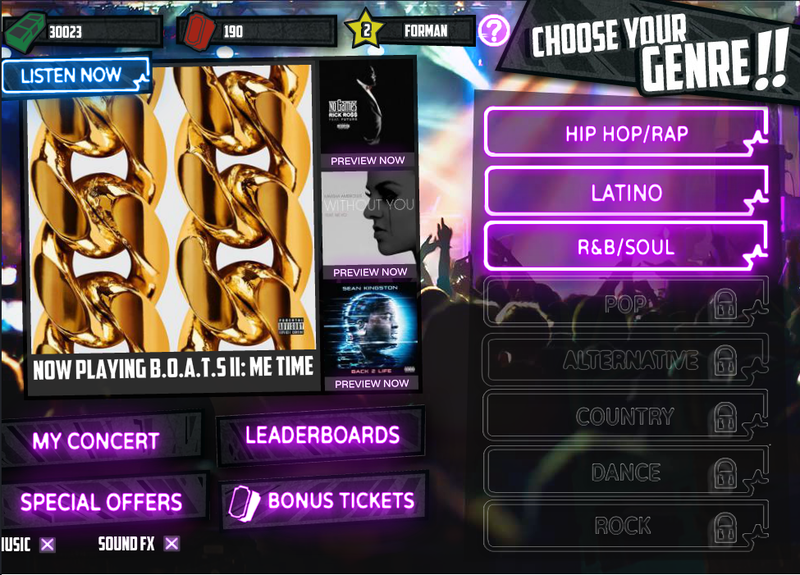 With licenses and agreements with many well-known rap and hip-hop artists, the gameplay focused around users assuming the role of a concert producer, picking out the venue, song list, backup dancers, and special effects to put together a concert and earn more in-game currency. The game has since been deactivated and removed from Facebook. I helped work on all parts of the functionality of the game, especially the front-end and UI. Here is the title screen, which showed off real music albums and tracks that players could purchase through the game. Additionally, buttons for promotional and microtransaction content is shown on the bottom left. On the right is the genre of music that you could pick from, in order to make a concert with songs and artists from that genre. On top, the in-game currencies were tracked, which were linked to each user’s Facebook profile. The main interface of the concert creation screen shows a timeline on the bottom, and different lists of effects that can be added at different points within the concert. This includes things such as backup dancers, a DJ, fog and laser effects, and lighting settings. I programmed and refactored much of the code controlling this timeline and effects process.